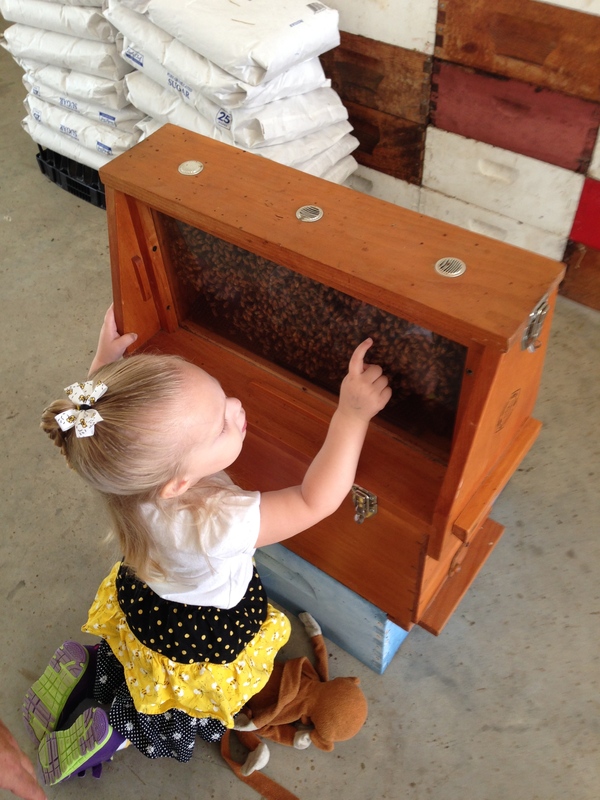 Becca has had a fascination with bees almost since the beginning. We chose to decorate her nursery with classic Pooh stuff – and a friend helped paint a gorgeous mural on the wall – with Pooh and Piglet floating with their blue balloon away from a hive of overprotective honeybees. This helped Cody’s mom to determine that she would call Becca “Honeybee.” So that’s part of it – the early indoctrination. But, she also loves the little kids show about friendship and family called “The Hive” – where the main character is a little honeybee named “Buzzbee.” If you haven’t seen it, it really is adorable, and the accents are great – they are all British. You can find it on Disney Jr, or on Netflix Kids. 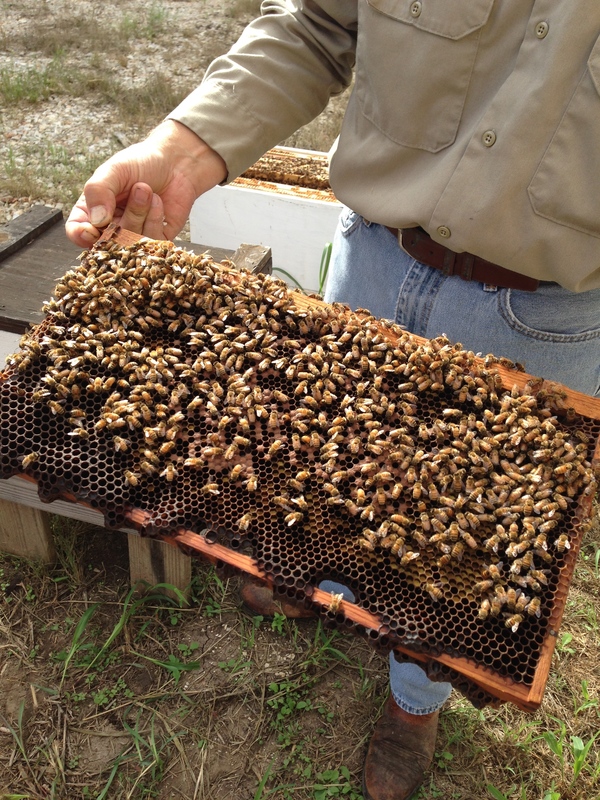 But then there’s the other aspect of honeybees that Becca loves, and that’s what they produce – honey! We go to the farmer’s market at the Pearl Brewery downtown (on the Riverwalk) every Saturday morning and participate in a CSA group with a local farmer. In walking back and forth to their booth every week, we passed several times (ok, passed every Saturday for like 10 months – I’m ashamed to admit) a booth that I finally stopped at one day. And man, am I glad I did!!! The Gretchen Bee Ranch bottles and sells at the market LOCAL honey! If you’ve been to a grocery store in San Antonio, you know that the closest “Local” you can find is sourced North of Austin… which isn’t local at all since it’s over three hours away and I guarantee you those bees aren’t flying anywhere down here to gather their pollen! So, if you’re looking for truly local honey to help with allergies, the Gretchen Bee Ranch is the place. I love that they even have a type of honey sourced in the county where we live – since we live about an hour West of where the ranch is. It’s awesome too – that every Wednesday they open up their shop for anyone! 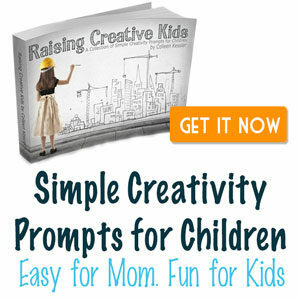 No age restrictions! 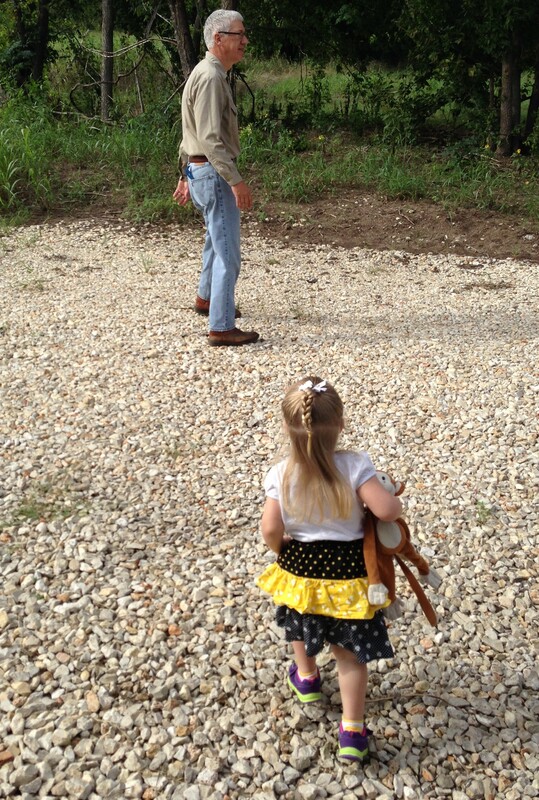 So I decided it was time to take my little honeybee out to the ranch to meet Mr. Mark (the bee keeper) and to learn some more about honeybees! You’d have thought I gave her a million bucks. 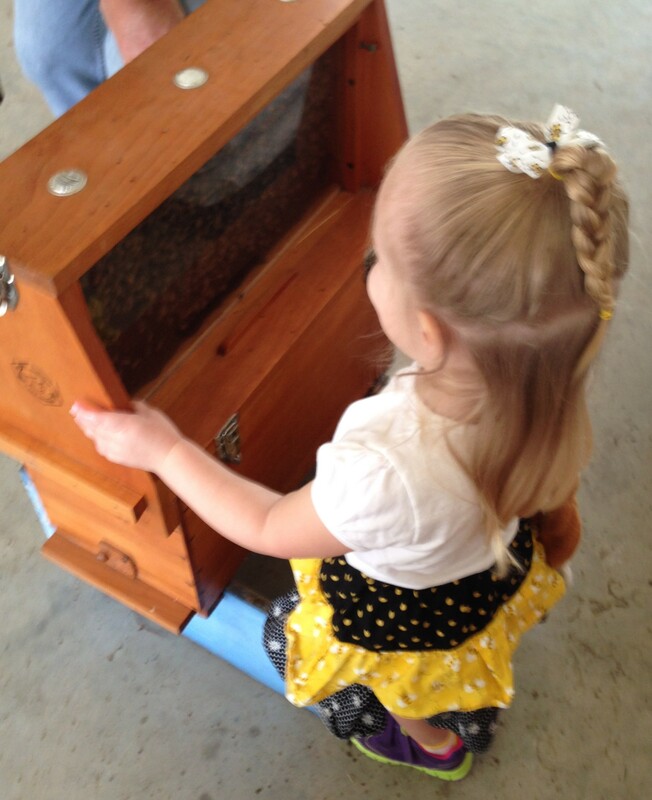 She has talked about those bees and all the honey she got to taste so much! She’s also super excited that we’re going back as a family to take Daddy when they have their open house in November! Here are a few pictures of our experience. I wish I had taken more! 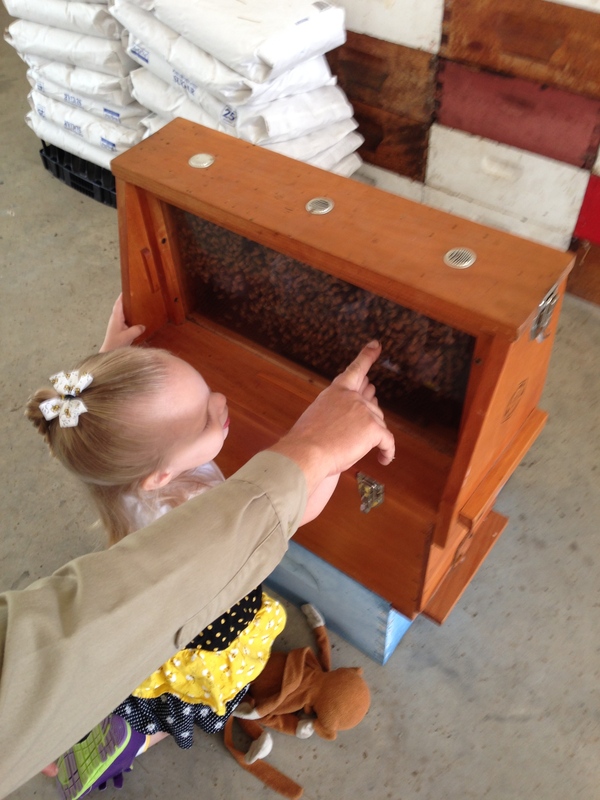 We got to look at some “sleepy” bees on their tray, and then in the display case, Mr. Mark pointed out the queen bee, and Becca enjoyed following her around with her finger, and went back a few times to find her again. I think she could have stood there and watched those bees all day long! She and George followed Mr. Mark over to see the bee hives (from a distance). 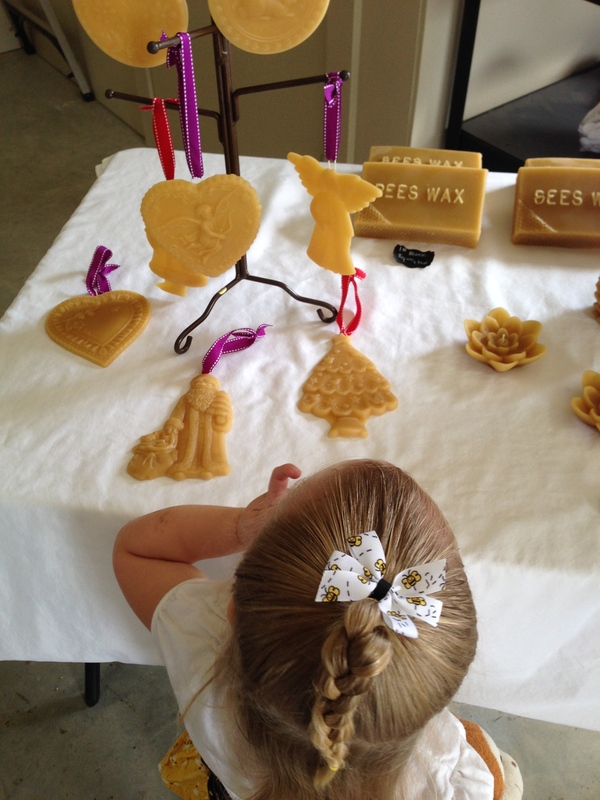 She enjoyed looking at the beeswax products, and tasting several kinds of honey! If you live anywhere near Seguin, it’s worth a trip! On the way home, she asked me a few questions about the bees, which we typed up together and sent in an email over Facebook, and Mr. Mark’s wife kindly answered them for us. Thank you for showing us the bees and the honey today! I have a couple of questions for you. How old are the bees? I’m two. Does the queen have a name? My name is Becca. How many bees live in a box? We have four people in our house. And two dogs and two fish and our kitty lives outside. What is a bee’s favorite weather? I like sunny days. Thanks for visiting the Bee Ranch this morning. Mark is working out in the bee yards so I will help by answering your questions. The bees all vary in age and depending on the time of year, their life span may be as short as three weeks in summer and three months when it’s winter. The queen bees do not have names. With over 150 queens, we call them all Queenie. During summer and at the height of honey production and food availability, a hive can grow to 100,000 bees! During cold times when there is not much to eat on, the queen knows to reduce her colony down to as low as perhaps 20,000. Bees adapt fairly well to weather but they do love the warm sun so that they can fly out to forage for food! You are just like a honeybee. Take care and enjoy every day. Wow! That’s crazy! I’m allergic to bees so I have a huge fear of them! I love that she wore black and yellow. and do you still have the mural? Would love to see a pic!